Thanks for visiting Oomph Redesigns. When it comes to decorating your entire Home, Home away from Home, Business, or just one room, Oomph Redesigns is the place to inspire you. 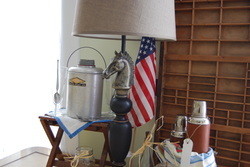 While you browse, and take a trip into the past you will find a mix of OLD & NEW: Antique, Vintage, Repurposed, Rejuvenated and some Reproductions. 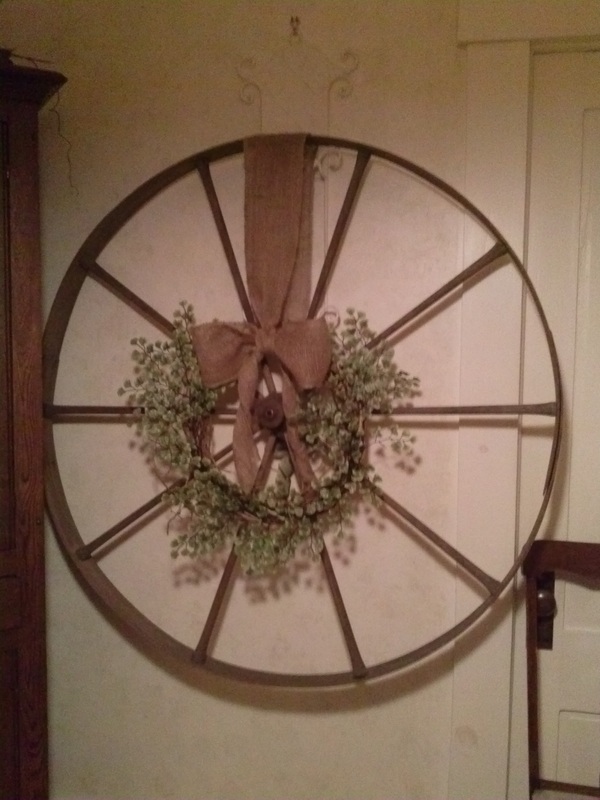 Picture to the Left is an example of a Repurposed Spinning Wheel: 45" Wheel from an Antique Spinning Wheel turned into Wall Décor embellished with a wreath of greens and large burlap bow. 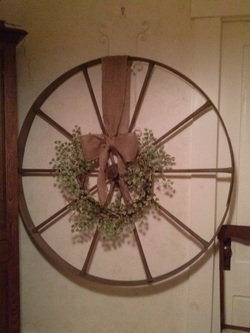 Perfect on a wall with Cathedral Ceilings; in a stair well, or above a mantle. 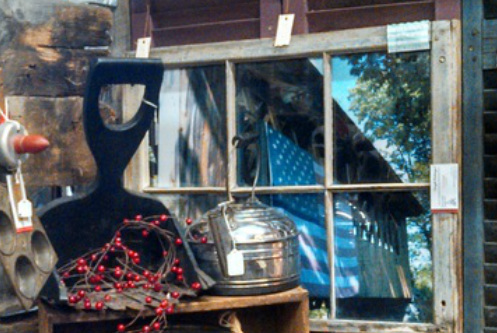 Pictured below is another example of what Oomph Redesigns has to offer: an antique, six pane window REPURPOSED into Americana, framed photographic art - American Flag draped/displayed on NH Covered Bridge #16 - all for your decorating pleasure! Browse our pages, visit us on Facebook and "like" us, along with a SHARE to your friends. Thanks! 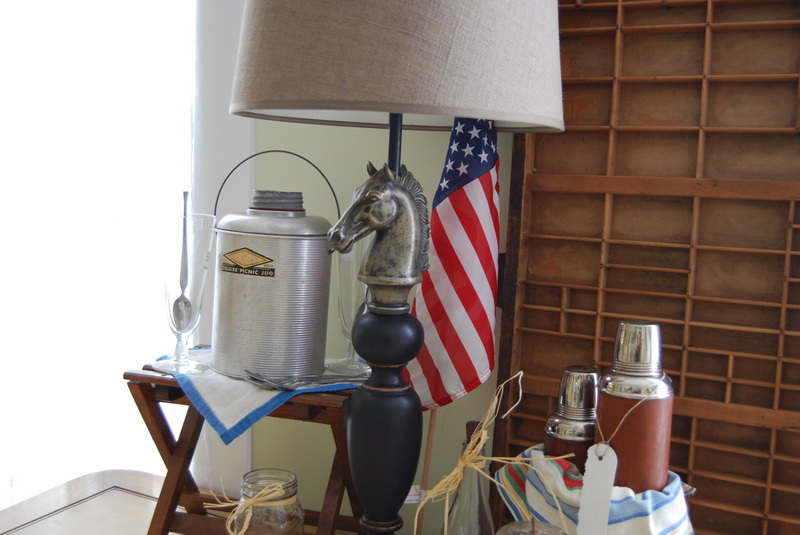 Photo of Antique NH Bridge #16 all decked out with American Pride - under glass/an Antique 6 pane window frames this Americana Art. "...land that I love. Stand beside her..."
Four Corners Brick House - Gilmanton, NH! 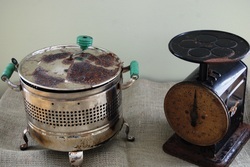 Repurposed Items: Nicely aged Vintage Popcorn Popper and Scale "BEFORE" Repurposing. SEE "AFTER" results below. 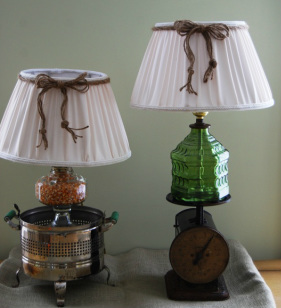 "AFTER" Results: YES, Lamps! Both are in two pieces for easy cleaning and portability. Scale Lamp top is secured with magnets to Scale base. Both SOLD October 2013! If you have any QUESTIONS or COMMENTS please contact Oomph Redesigns.